Hmmm, color me surprised, and sort of disappointed. 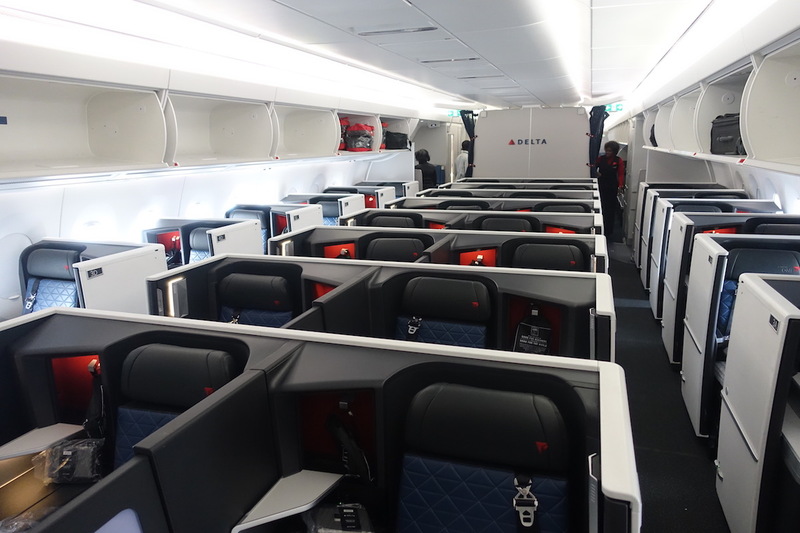 Delta has been working on reconfiguring their long haul fleet with new interiors, and overall I’ve been impressed. This process started with the Airbus A350-900. 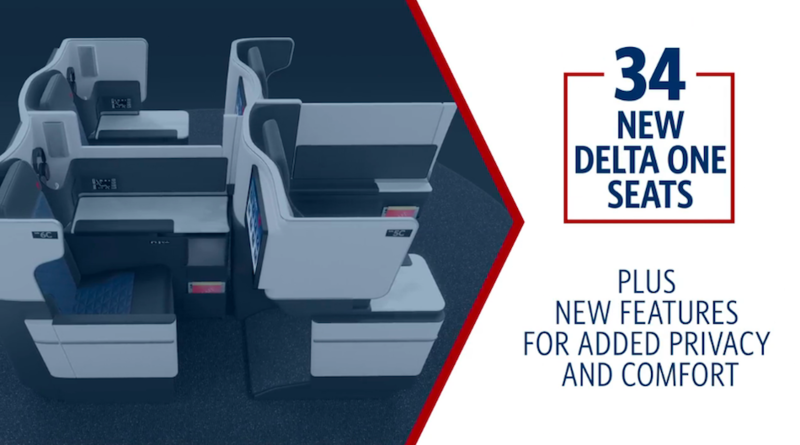 Delta took delivery of these planes with new Delta One Suites, as well as with Delta Premium Select, which is the name of their new international premium economy. Delta will also take delivery of A330-900neos later this year with the new seats. The airline has now started the process of reconfiguring their 777-200s, and we know that next up are the 767-400s. Delta uses the 767-400s for many of their transatlantic routes, especially from the East Coast. So far Delta has been tight-lipped about what exactly the business class product on the 767-400 will be like. Well, sort of. 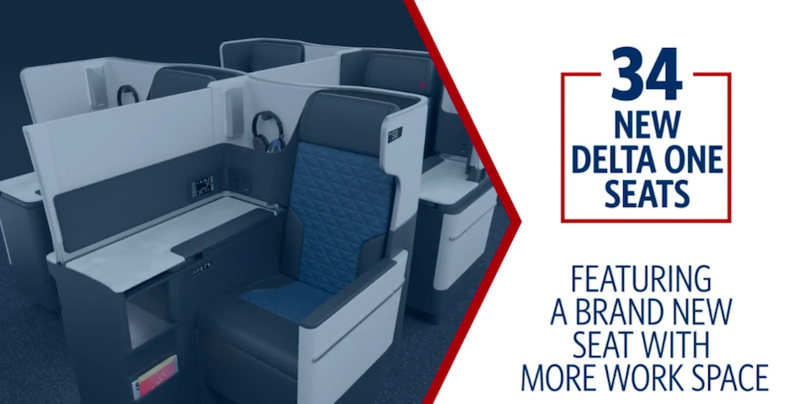 They have said that the will bring it up to their “flagship” experience, and Delta CEO Ed Bastian has even promised that the seats will have doors. Well, as it turns out, that won’t be the case. Personally I’m not surprised, as I questioned how they could install this product without making the configuration 1-1-1, given how narrow the 767 is. In a video about their transatlantic expansion that was published today on the Delta News Hub, Delta provides the first glimpse of the new 767-400. Delta’s first reconfigured 767-400 is expected to enter the fleet in November 2019. The new planes will feature 34 seats rather than the current 40 seats. However, these won’t be Delta One Suites, but rather will be Delta One Seats. I might be missing something, but it sure seems to me like these seats won’t have doors. As a matter of fact, it seems to me like they might just be keeping the same “bones” of the current seats, and will make them more private. Personally I’m not too surprised by this, given how narrow the 767 is. However, this product doesn’t seem like it will be competitive with the product on the A350 and 777. I’ve long said how I find a staggered configuration on a 767 to be tight, and that’s something that isn’t changing here. 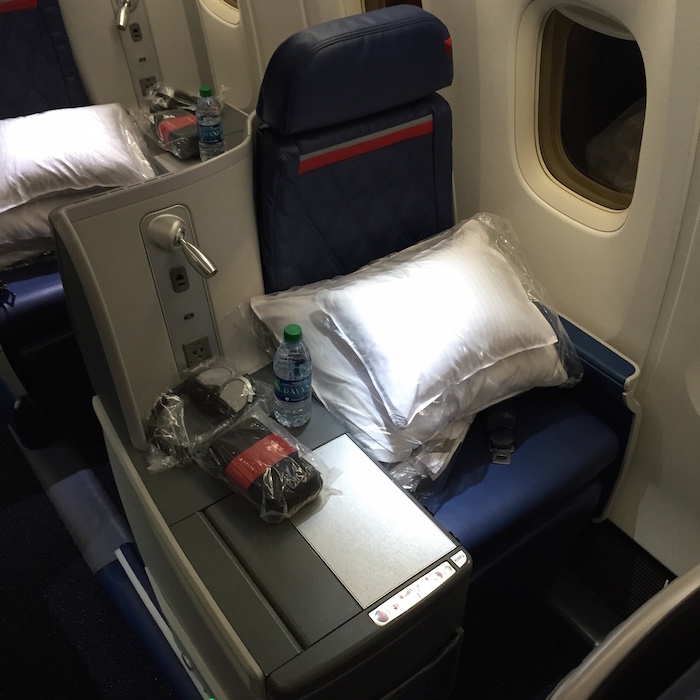 Is this new seat what you were expecting from Delta, or no? Aren’t the aisles on the A350 also quite narrow because the width of the suites? Id be surprised if they even install suites on their a330neo’s. @ Ben — This is the greatest thing ever per a certain other clueless blogger. Is it basically the current seat with more privacy dividers or am I missing something? My only issue with their current 767 seat is the footwell. It looks like these have a more open one, and if that’s the case I like them. I think a door is nice, but I don’t have the same infatuation as many seem to. It’s a uniquely American to be so obsessed with privacy. Are these going to be installed on all 767s or just -400s? That would be a comfortable ride from LAX to JFK. Looks no better than the existing 767 product….and I will continue to go out of my way to avoid it. New seat, updated IFE screen and slightly more privacy. I see nothing wrong with this for flights that are around 7 hours to LHR from JFK and BOS. Not what I was expecting. I would at least hope they would widen the seats since I find the current 767 too tight as well. I’m not even a big guy but my shoulders touch the seat walls when in lieflat position and makes it uncomfortable to sleep. I don’t have that issue with current BA seats and people complain about that seat being tight. I was hoping that they would adopt the UA configuration with a single seat in the middle but apparently that isn’t going to happen. As it looks now this is nothing more than lipstick on a rather old pig. The Polaris seat is better. I feel like I’m being gas lighted. Why do having doors (or not) on Delta make any difference. They only come up to the waist (at its highest), and the only privacy you’d get is from crawling infants and small children. NOTHING IS HIDDEN OR RENDERED PRIVATE. I feel like I’m going nuts with people saying this is important (now, for other suites with floor to ceiling privacy doors – that’s the real thing). It offers no privacy. Am I missing something? Fine for short flights from JFK/BOS to Europe, and for transcons. Are these 34 new seats taking all the space currently occupied by 40 seats? If so, then it would seem that there should be improvements for accommodating your feet in bed mode, no? As a Delta Diamond, I’ve become frustrated with the 767 Delta One setup. When I fly overseas I effort to get into A330 routes because those seats up front are such a significant upgrade. When it makes sense, on transcon routes I’ve taken JetBlue instead because Mint is so much better than the 767 Delta One. I’ve even taken AA because their business class, even with 2-2 on the A321 is just more comfortable. And AA biz is often much cheaper. Going to Tokyo soon via Seattle and I’m bending plans to avoid the 767 on the route because they’re starting A330-neos on some routes there. Overall I love Delta and I spend a lot of money with them. But the 767 hard product is frankly substandard and it’s disappointing what Ben is telling us here. I purposefully avoid coffin class on delta. The seats are so narrow one cannot even lay down on their back . It all depends on who you talk to. Personally, I agree with you. Doors that don’t go all the way to the roof seem pretty silly. But when you read a travel blog like Lucky’s you’re always going to be reading things through his mind, and his personal points of emphasis may be different than yours or mine. He always talks about air nozzles, which some people don’t care about and some do (I do, for example) and doors (which I don’t). So the reason it’s a big deal on this blog is because it’s a big deal for Lucky. If you go to another blog you may find that they don’t care about that as much. I much prefer the 1-1-1 layout United has adopted with the new Polaris seats on the 767’s. This layout seems quite cramped by comparison. The Delta one suites seem nice but I’d choose UA over DL for a 767 any day. It’s unfortunately that they have plastic covers (90% plastics 10% leather) which are quite uncomfortable on long flights as they don’t absorb your natural perspiration. It’s sad actually to see DL retrofitting and upgrading this ancient aircraft. Only means that they will be in the fleet for way more years. The configuration is very tight for comfortable sleep, and that’s the opinion of a 120 pound woman. They should have gone with a 1-1-1 layout. This POV makes so much more sense than the nonesense posted by TPG. They even mentioned the new seat on the 767 is shrinking in width by 1″!! As if it wasn’t narrow enough already! 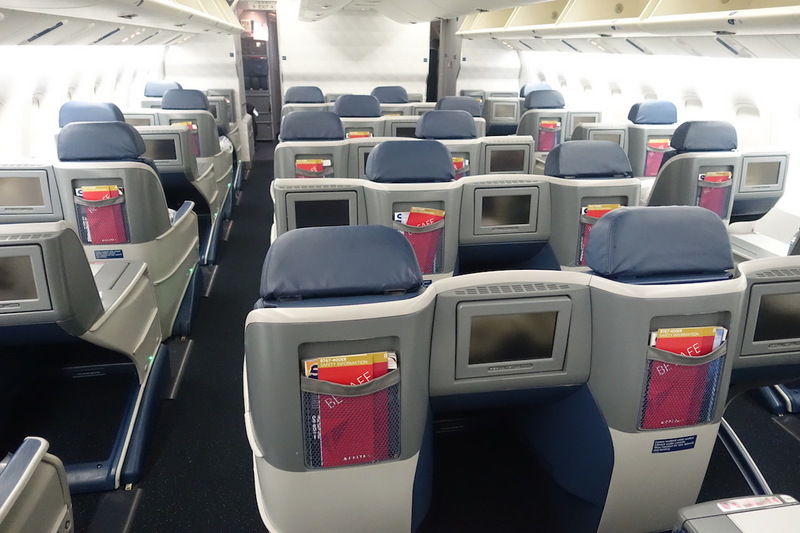 Think about it… Delta is asking 640,000 miles to be in these seats for round trip Chicago and Amsterdam in August. So I went through a few of my past flights and looked the MQD (spent $) and Skymiles received. I got an average of $0.09 spent on Delta ticket to get 1 skymiles. That is $59,090 Delta ticket to get 640,000 skymiles. Am I counting this correctly? This can’t be, can it? it’s nothing about “innovation” – it’s trying too hard to create a differentiator (and giving worthless trolls like UA-NYC a talking point the same way android people used to be talk about removable batteries). Also nothing to do with cabin width either – you can see UA modifying their 1-2-1 true Polaris into 1-1-1 for 767 re-configs, so “1-2-1” isn’t set in stone if you’re outside-thinking enough to adjust it to 1-1-1 for a much narrower cabin. and you can see how DL’s actions don’t match their words. On a larger 764 that is explicitly listed for JFK/BOS-LHR (the most business of business markets), DL shrinks J to 34. While UA, reconfigring a smaller 763 for NYC-LHR, but flying from the much chastised EWR, they’re putting 46 J. And you can see the DL LGW announcement through the same lens as their Mumbai “announcement” – giving enough details to create a false narrative for weeks and months, and by providing absolutely zero details on the the actual flights themselves, gave themselves an easy way out if they’re going cold turkey by blaming “changing market conditions”. Gone are the days when route announcements actually come with flight times, plane types, and specific launch dates. If you excuse my poker analogy, this is a form of “string betting”, and they wonder why others who aren’t drinking their kool-aid aren’t worshipping them like pagans at a shrine. Much more leg room but almost the width of economy’s seat, it seems. Economy is 2+3+2. Business class is the same but you stick your feet under the row ahead (and have a little visual space over the feet of the person behind you). @Endre- I’m seeing those destinations and flights on DL in August for 210,000 miles – which would translate to around $19,000 by your calculations. Maybe you selected some crazy flight days that were low on inventory. I just redeemed some DL flights in J for August with for 210,000 miles – no bargain, but I’ve seen much worse. Endre – Or how about simply buying that round trip from ORD to AMS for $4,700 round trip? @Donna, @Anthony… you are both correct. Thank you for the input. More Delta vapor ware – HenryLAX has it right. UNITED is rising and beats the pants off this with its 767 Polaris – all without reducing J seat counts. High value fliers will see right through this as UNITED leads and Delta can’t keep up. @endre – you are correct. It’s insane how many miles are required for an international biz class flight from LA. I’ve seen many tickets north of 500k I’m miles. Basically making them worthless. I have been disappointed with Delta since the first 767-400 was introduced into their fleet. The good old days of the first/business class in the L10-11 or the 747-400 was superior. I have been a dedicated Delta Medallion flyer for over 30 years because I live in SLC, UT. 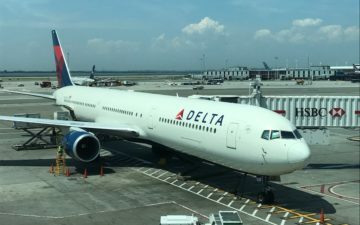 So not only will Delta have an inferior seat on an old aircraft but it still lacks the business-class lounge or elevated dining that both American and United offer their highest class of service. Delta has no exclusive lounges or dining for its highest class of service, Delta One. Moreover, why are they taking away 6 seats? Here’s why: they don’t want us using global upgrade certificates and don’t want us using miles. That’s why. Honestly, not really surprised at all. It was kind of obvious that it would still be 1-2-1 and that doors would be hard to fit when they announced the 34-seat count a few weeks ago. The 767 has always been the lowest-end of Delta’s widebodies and it looks like it will remain so, which really isn’t surprising. This will mostly just be running relatively short trans-Atlantic routes and transcons. Perhaps a handful of thin trans-Pac routes will use them. While I was hoping that they’d go 1-1-1 (before seeing the seat count a few weeks ago,) I’m really not surprised at all that they didn’t, since they mostly run these aircraft on shorter and/or less premium medium-haul and long-haul routes. Over the next few years, more and more of their longer or more premium routes will be switching to the A330 or A350. Not really surprised by the reduced seat count, either. They’re going from 3 cabins to 4. I don’t know why there is such focus on a door that does not do much other than make it feel clostrophobic. No need to fret for Endre. Remember that he only “pays” for first class, so why would he ask about mileage redemption? Also, with Delta it is only business class, so he would not try it according to his point of view. Not like anyone ever would believe him. Like he once said, he only flies OW carriers especially Asian carriers. So, why would he ask about Delta, a SkyTeam carrier, and a non-Asian carrier? Yeah…..uh huh…..I guess others who know him are just fed up with him, so they do not call him out any more. He will just make some stupid crybaby comments and says you only ever fly coach, etc. What else is new with this pathetic guy? 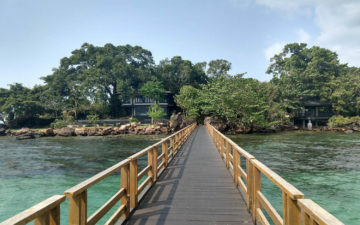 @Stanley – I have been reading the blog for six years. That is a different Endre. Endre with a picture is the courteous, original Endre who like me has been a long-time reader and helpful commenter. When you see the name without the photo, that is the troll. I feel sorry for the honest man who shares the name! @Brooklyn Boy Oh…thank you for pointing that out. I see. I appreciate it. @Endre to the courteous Endre, I am sorry for confusing you with the troll. I wish someone had told me that the doors don’t actually offer privacy. I feel ashamed now. At least if there are no doors I won’t make that mistake again. 1) I don’t understand why Delta would reduce the number of business-class seats. Delta should have increased them and increased premium-economy while decreasing economy. The cabins are mostly full. Meanwhile, United is ADDING business-class and premium-class seats in a greater number than Delta. 2) The doors on the Delta One suites are useless because they do not close all the way. I flew with Cathay First last week and it opened my eyes to how important soft product is. Don’t get me wrong, if other factors were equal, I’d rather have a suite seat over a no suite seat, but I’ll gladly take Cathay’s level of service or Emirates ridiculousness or Air Canada’s Signature Suite or even BA’s million dollar door over any of the US business class offerings; the door is not the most important factor here. Delta…the most overrated airline in America. I really fail to understand the die hard following they seem to have garnered in the last years. Delta One is all talk. Horrible color scheme, useless doors, and outrageously high cost on SkyMiles. Not to mention, the DISASTER that is Delta at LAX. Definitely concerned about these seats being cramped since it looks like the footprint will be similar to the current seat. That said, this does still look like a totally different seat … the aisle-side armrest design is totally different, for example, and it looks like it will no longer be possible to walk across between the two center seats as it is now. I agree it’s surprising they didn’t go for 1-1-1, though, especially since they’ve announced they’re going to put these planes on BOS and JFK to London, where you’d think they’d want to make sure they have their very best product, especially with BA and VS stepping their game up. HenryLAX keep producing that paid content for UA! Seems like you can’t comment on any OAL article without bringing in pro-UA points…hmmm suspicious. The new seats are an upgrade over the current seats. Just the IFE alone is enough to get excited about using a nice sharp screen. The 767s are due a refresh for sure. The current interiors are beat up and should have been updated awhile ago. Typical Delta brainwashing and marketing…a bunch of fluff and hype!